It is almost like the apostles knew what they were talking about 2000 years ago. Good thing we have (((psychiatrists))) to tell us what God got wrong. Have you ever read Freud himself rather than books written about him? Freud was no sexual liberal, that comes later from people like Wilhelm Reich & Erich Fromm who was from the Frankfurt School & we all know what that was about. Freud found that a certain group of people could not cope with the sexual thoughts & fantasies that are normal for most people & these people repressed their sexual thoughts in order to escape them. The repressed would return however in the form of symptoms & the result would be Hysteria, Phobia or Obsessions i.e. neurotic illness. This group of people i.e. neurotics were too repressive towards themselves. Freud certainly did not advocate free love, interfering with children, paedophilia etc. He saw that harm came from that, See some of his case studies such as Katharina in 'Studies on Hysteria'. You are giving Paul all kinds of credit he doesn't deserve. He didn't invent the idea that women should be loved! Good grief. You can look at the beauty of the Greeks and Romans at that time and see they weren't genetic degenerates. 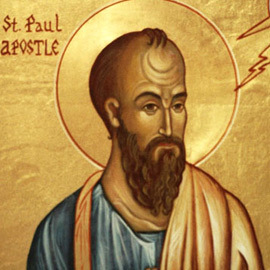 The icon of the Apostle Paul leads me to one question: Was Paul a Klingon?